(Nanowerk Spotlight) To build microprocessors with more than one billion transistors, manufacturers use photolithography, the high-tech, nanoscale version of printing technology. But no matter how sophisticated these patterning processes have become, driven by the needs of the semiconductor industry, projection photolithography is mostly limited to flat surfaces. However, many emerging areas of micro- and nanotechnology applications, be it in optics, imaging, sensors or bioengineering, increasingly require the fabrication of microscopic and nanoscopic patterns on nonplanar surfaces. "Contact printing and imprinting methods can cope with certain curved surfaces but appear to be restricted to those having a constant magnitude of curvature and a large radius of curvature relative to the arc length at least in one dimension," Li Jia explains to Nanowerk. 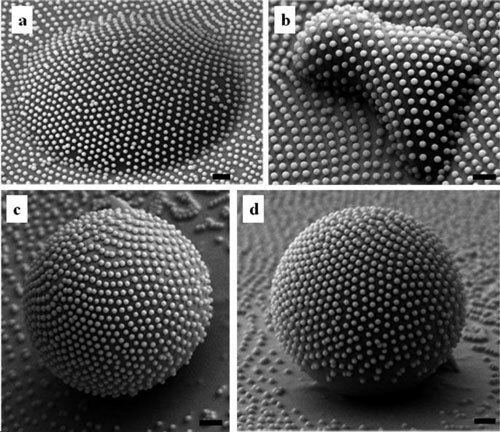 "We have recently demonstrated that hexagonal noncontiguously packed (HNCP) colloidal crystals trapped at the air-water interface can be directly transferred onto solid substrates to give HNCP and distorted HNCP patterns." Jia, an assistant professor of polymer science at the University of Akron, and his team have developed a colloidal lithography method for patterning nonplanar surfaces. This bottom-up method uses self-assembled nanoparticle arrays and is not limited to flat surfaces at all. Describing their findings in a recent issue of Langmuir ("Development of a Colloidal Lithography Method for Patterning Nonplanar Surfaces") Jia and his team describe how to pattern curved or topographically uneven surfaces. Nanoparticles arranged in hexagonal pattern have been widely used for surface patterning before, but these particles are always touching each other and supporting each other. "We were curious whether we could do surface patterning when the particles are standing alone, not supporting each other" Jia describes the motivation for their work. "There are several advantages if we can do this. Among them, of course, is the possibility of patterning curved or uneven surfaces." The method is conceptually simple. The formation of the interfacial HNCP crystal is a result of the minimization of electrostatic repulsion between the same charged particles in a confined area. "Transfer of the colloidal crystal from the air-water interface can be accomplished by generating electrostatic and van der Waals attractions between the particles and the solid substrate" explains Jia. "These attractive forces are also expected to overcome the lateral capillary force acting on the particles when a thin film of water, which inevitably accompanies the particles onto the substrate, dries. In principle, the method is ideal for patterning topographically uneven surfaces because the initial colloidal array is formed at the fully pliable air-water interface." He points out that, when reducing the conceptually straightforward process to practice, preservation of the pattern against the lateral capillary force in the drying stage poses a sizable challenge. "We overcame this problem by utilizing a layer of polymer adhesive to improve the adhesion between the particles and the substrate and are consequently able to avoid any post-transfer steps" he says. "We first developed the present method – which is suitable for both inorganic and organic particles – using flat silicon wafers and then applied it to curved surfaces." Because the lateral capillary force increases with the decrease in the interparticle distance, the minimal achievable interparticle distance can be expected to be a finite value, beyond which adhesion between the particles and the solid surface mediated by the adhesive layer would yield to the capillary force. Jia says that this colloidal lithography method is very general and can in principle be adopted for any particles and substrates as long as an appropriate adhesive layer is applied. "Although the size of the substrate in our experiments has typically been 1 x 1 cm2, there does not appear to be a fundamental reason that prevents the present method from being applied tomuch larger substrates" says Jia. "Furthermore, the patterns that it can produce should not be limited to simple hexagonal or distorted hexagonal symmetries. 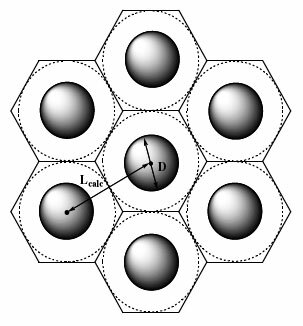 Nonspherical particles and binary particles can potentially be employed to expand pattern diversity and complexity." He notes that, from a practical viewpoint, the fabrication of optical elements with combined refractive, diffractive, and subwavelength structures, for example, microlens arrays with antireflective subwavelength gratings, is an immediate application with a high probability of succeeding. Another immediate application could be the fabrication of surfaces with a combination of several advanced properties, for example, self-cleaning, anti-reflection, and anti-icing. These surface properties are desirable for skyscrapers, air-crafts, solar panels, or even residential windows. Other near-term applications likely would emerge from the bioengineering area, where microscopic and nanoscopic surface topographies have been shown to play important roles in cell proliferation and differentiation. Before this surface patterning technique becomes suitable for industrial use, the researchers need to demonstrate that their method can be applied to large area fabrication. They also have to demonstrate that the surface patterns are robust under various conditions, for example, temperature fluctuation and abrasion.